This country-inspired cutlery is perfect bringing a relaxed feel to fine dining, these Utopia Doria Steak Knives are ideal for commercial use in restaurants, pubs or dining at home. Made from 18/0 stainless steel and elegant black resin handles, this flatware offers durability and style. 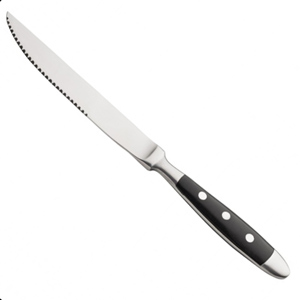 With a serrated edge for slicing steak or pizza with ease.